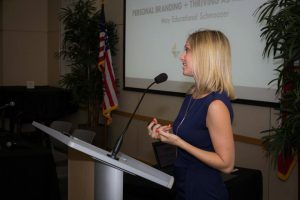 The Elite OC recently hosted a powerful educational seminar focused on ‘Achieving Success’ and ‘Making a Difference’, two pillars on which the young professionals society was founded. 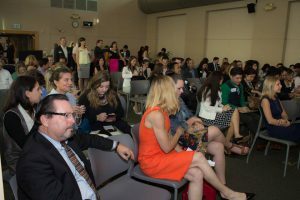 Over 70 professionals gathered to listen to an interactive panelist session featuring two successful figures in the community – Ivo Tjan, President and CEO of CommerceWest Bank, and Matt Steward, Co-Founder of National Service Group. Always striving to bring awareness and support to regional non profits, The Elite OC partnered with Mercy House for this event. Attendees were asked to donate personal care supplies as their admission, which went to support the variety of homeless populations that Mercy House serves in the local community. After time spent networking and enjoying the continental breakfast, attendees enjoyed a riveting discussion between Mr. Tjan and Mr. Steward, who spoke on tips to achieving success, why some people succeed and most people fail, carving a career path, and how to make an impact both personally and professionally. La Voz Marketing was happy to support this inspirational event and would like to give a special thanks to The Elite OC and its guest speakers for encouraging young professionals to give back while building a path to success. 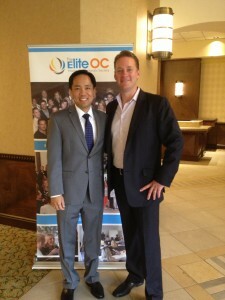 For more information on how to become involved with The Elite OC, visit TheEliteOC.com or facebook.com/TheEliteOC. 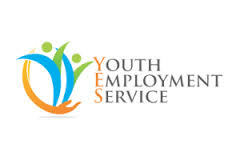 We are excited to share this unique educational event hosted by The Elite OC Young Professionals Society. On Thursday, February 21st, at The Island Hotel in Newport Beach, a vibrant group of young professionals will come together to enjoy a delicious 3-course meal, network, give back to the Newport/Mesa Pro Literacy program, and absorb valuable business etiquette lessons from Theresa Thomas. RSVP for this unique event at theeliteoc.eventbrite.com. 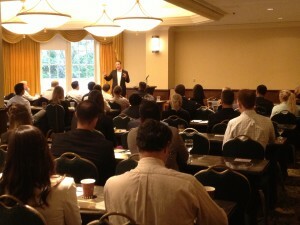 The event costs $50, which includes a full dinner and educational session. Please also bring a Classic Middle School Novel to donate to the group’s highlighted charity of the evening: Newport/Mesa ProLiteracy, a program which provides free literacy instruction to adults who live or work in the Newport Beach area. For more information, visit newportbeachlibrary.org.